A head-related transfer function (HRTF) also sometimes known as the anatomical transfer function (ATF) is a response that characterizes how an ear receives a sound from a point in space. As sound strikes the listener, the size and shape of the head, ears, ear canal, density of the head, size and shape of nasal and oral cavities, all transform the sound and affect how it is perceived, boosting some frequencies and attenuating others. Generally speaking, the HRTF boosts frequencies from 2–5 kHz with a primary resonance of +17 dB at 2,700 Hz. But the response curve is more complex than a single bump, affects a broad frequency spectrum, and varies significantly from person to person. A pair of HRTFs for two ears can be used to synthesize a binaural sound that seems to come from a particular point in space. It is a transfer function, describing how a sound from a specific point will arrive at the ear (generally at the outer end of the auditory canal). Some consumer home entertainment products designed to reproduce surround sound from stereo (two-speaker) headphones use HRTFs. Some forms of HRTF-processing have also been included in computer software to simulate surround sound playback from loudspeakers. Humans have just two ears, but can locate sounds in three dimensions – in range (distance), in direction above and below, in front and to the rear, as well as to either side. This is possible because the brain, inner ear and the external ears (pinna) work together to make inferences about location. This ability to localize sound sources may have developed in humans and ancestors as an evolutionary necessity, since the eyes can only see a fraction of the world around a viewer, and vision is hampered in darkness, while the ability to localize a sound source works in all directions, to varying accuracy, regardless of the surrounding light. The HRTF is the Fourier transform of HRIR. HRTFs for left and right ear (expressed above as HRIRs) describe the filtering of a sound source (x(t)) before it is perceived at the left and right ears as xL(t) and xR(t), respectively. The HRTF can also be described as the modifications to a sound from a direction in free air to the sound as it arrives at the eardrum. These modifications include the shape of the listener's outer ear, the shape of the listener's head and body, the acoustic characteristics of the space in which the sound is played, and so on. All these characteristics will influence how (or whether) a listener can accurately tell what direction a sound is coming from. In the AES69-2015 standard, the Audio Engineering Society (AES) has defined the SOFA file format for storing spatially oriented acoustic data like head-related transfer functions (HRTFs). SOFA software libraries and files are collected at the Sofa Conventions website. The associated mechanism varies between individuals, as their head and ear shapes differ. HRTF describes how a given sound wave input (parameterized as frequency and source location) is filtered by the diffraction and reflection properties of the head, pinna, and torso, before the sound reaches the transduction machinery of the eardrum and inner ear (see auditory system). Biologically, the source-location-specific prefiltering effects of these external structures aid in the neural determination of source location, particularly the determination of the source's elevation (see vertical sound localization). for a sound source from upward front. Linear systems analysis defines the transfer function as the complex ratio between the output signal spectrum and the input signal spectrum as a function of frequency. Blauert (1974; cited in Blauert, 1981) initially defined the transfer function as the free-field transfer function (FFTF). Other terms include free-field to eardrum transfer function and the pressure transformation from the free-field to the eardrum. Less specific descriptions include the pinna transfer function, the outer ear transfer function, the pinna response, or directional transfer function (DTF). One method used to obtain the HRTF from a given source location is therefore to measure the head-related impulse response (HRIR), h(t), at the ear drum for the impulse Δ(t) placed at the source. The HRTF H(f) is the Fourier transform of the HRIR h(t). Even when measured for a "dummy head" of idealized geometry, HRTF are complicated functions of frequency and the three spatial variables. For distances greater than 1 m from the head, however, the HRTF can be said to attenuate inversely with range. It is this far field HRTF, H(f, θ, φ), that has most often been measured. At closer range, the difference in level observed between the ears can grow quite large, even in the low-frequency region within which negligible level differences are observed in the far field. HRTFs are typically measured in an anechoic chamber to minimize the influence of early reflections and reverberation on the measured response. HRTFs are measured at small increments of θ such as 15° or 30° in the horizontal plane, with interpolation used to synthesize HRTFs for arbitrary positions of θ. Even with small increments, however, interpolation can lead to front-back confusion, and optimizing the interpolation procedure is an active area of research. In order to maximize the signal-to-noise ratio (SNR) in a measured HRTF, it is important that the impulse being generated be of high volume. In practice, however, it can be difficult to generate impulses at high volumes and, if generated, they can be damaging to human ears, so it is more common for HRTFs to be directly calculated in the frequency domain using a frequency-swept sine wave or by using maximum length sequences. User fatigue is still a problem, however, highlighting the need for the ability to interpolate based on fewer measurements. 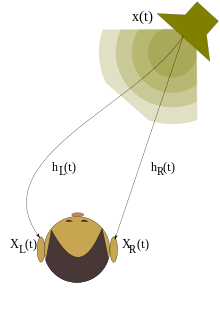 The head-related transfer function is involved in resolving the Cone of Confusion, a series of points where ITD and ILD are identical for sound sources from many locations around the "0" part of the cone. When a sound is received by the ear it can either go straight down the ear into the ear canal or it can be reflected off the pinnae of the ear, into the ear canal a fraction of a second later. The sound will contain many frequencies, so therefore many copies of this signal will go down the ear all at different times depending on their frequency (according to reflection, diffraction, and their interaction with high and low frequencies and the size of the structures of the ear.) These copies overlap each other, and during this, certain signals are enhanced (where the phases of the signals match) while other copies are canceled out (where the phases of the signal do not match). Essentially, the brain is looking for frequency notches in the signal that correspond to particular known directions of sound. If another person's ears were substituted, the individual would not immediately be able to localize sound, as the patterns of enhancement and cancellation would be different from those patterns the person's auditory system is used to. However, after some weeks, the auditory system would adapt to the new head-related transfer function. The inter-subject variability in the spectra of HRTFs has been studied through cluster analyses. A basic assumption in the creation of a virtual auditory space is that if the acoustical waveforms present at a listener’s eardrums are the same under headphones as in free field, then the listener’s experience should also be the same. Typically, sounds generated from headphones appear to originate from within the head. In the virtual auditory space, the headphones should be able to “externalize” the sound. Using the HRTF, sounds can be spatially positioned using the technique described below. Therefore, theoretically, if x1(t) is passed through this filter and the resulting x2(t) is played on the headphones, it should produce the same signal at the eardrum. Since the filter applies only to a single ear, another one must be derived for the other ear. This process is repeated for many places in the virtual environment to create an array of head-related transfer functions for each position to be recreated while ensuring that the sampling conditions are set by the Nyquist criteria. There is less reliable phase estimation in the very low part of the frequency band, and in the upper frequencies the phase response is affected by the features of the pinna. Earlier studies also show that the HRTF phase response is mostly linear and that listeners are insensitive to the details of the interaural phase spectrum as long as the interaural time delay (ITD) of the combined low-frequency part of the waveform is maintained. This is the modeled phase response of the subject HRTF as a time delay, dependent on the direction and elevation. A scaling factor is a function of the anthropometric features. For example, a training set of N subjects would consider each HRTF phase and describe a single ITD scaling factor as the average delay of the group. This computed scaling factor can estimate the time delay as function of the direction and elevation for any given individual. Converting the time delay to phase response for the left and the right ears is trivial. where The ITD scaling factors for all persons in the dataset are stacked in a vector H ∈ RN, so the value Hn corresponds to the scaling factor of the n-th person. where The HRTFs for each subject are described by a tensor of size D × K, where D is the number of HRTF directions and K is the number of frequency bins. All Hn,d,k corresponds to all the HRTFs of the training set are stacked in a new tensor H ∈ RN×D×K, so the value Hn,d,k corresponds to the k-th frequency bin for d-th HRTF direction of the n-th person. Also H'd,k corresponds to k-th frequency for every d-th HRTF direction of the synthesized HRTF. 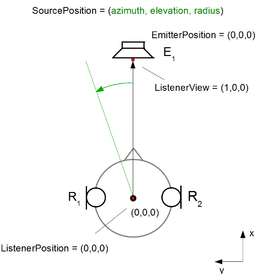 Recordings processed via an HRTF, such as in a computer gaming environment (see A3D, EAX and OpenAL), which approximates the HRTF of the listener, can be heard through stereo headphones or speakers and interpreted as if they comprise sounds coming from all directions, rather than just two points either side of the head. The perceived accuracy of the result depends on how closely the HRTF data set matches the characteristics of one's own ears. ^ Daniel Starch (1908). 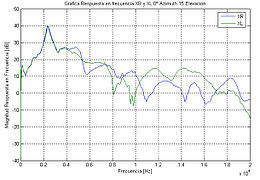 Perimetry of the localization of sound. State University of Iowa. p. 35 ff. ^ Begault, D.R. (1994) 3D sound for virtual reality and multimedia. AP Professional. ^ So, R.H.Y., Leung, N.M., Braasch, J. and Leung, K.L. (2006) A low cost, Non-individualized surround sound system based upon head-related transfer functions. An Ergonomics study and prototype development. Applied Ergonomics, 37, pp. 695–707. ^ "AES Standard » AES69-2015: AES standard for file exchange - Spatial acoustic data file format". www.aes.org. Retrieved 2016-12-30. ^ "Sofa Conventions Website". Acoustics Research Institute, a research institute of the Austrian Academy of Sciences. ^ Blauert, J. (1997) Spatial hearing: the psychophysics of human sound localization. MIT Press. ^ Hofman, Paul M.; Van Riswick, JG; Van Opstal, AJ (September 1998). "Relearning sound localization with new ears" (PDF). Nature Neuroscience. 1 (5): 417–421. doi:10.1038/1633. PMID 10196533. ^ So, R.H.Y., Ngan, B., Horner, A., Leung, K.L., Braasch, J. and Blauert, J. (2010) Toward orthogonal non-individualized head-related transfer functions for forward and backward directional sound: cluster analysis and an experimental study. Ergonomics, 53(6), pp.767-781. ^ a b Carlile,S (1996). "Virtual Auditory Space and Applications". Austin, TX, Springer. ^ a b Tashev, Ivan (2014). "HRTF PHASE SYNTHESIS VIA SPARSE REPRESENTATION OF ANTHROPOMETRIC FEATURES". Information Technology and Applications Workshop,San Diego, CA, USA, Conference paper: 1–5. doi:10.1109/ITA.2014.6804239. ^ a b Bilinski,Piotr; Ahrens, Jens; Thomas, Mark R.P; Tashev, Ivan; Platt,John C (2014). "HRTF MAGNITUDE SYNTHESIS VIA SPARSE REPRESENTATION OF ANTHROPOMETRIC FEATURES". IEEE ICASSP, Florence, Italy: 4468–4472. doi:10.1109/ICASSP.2014.6854447. This page was last edited on 25 January 2019, at 21:06 (UTC).